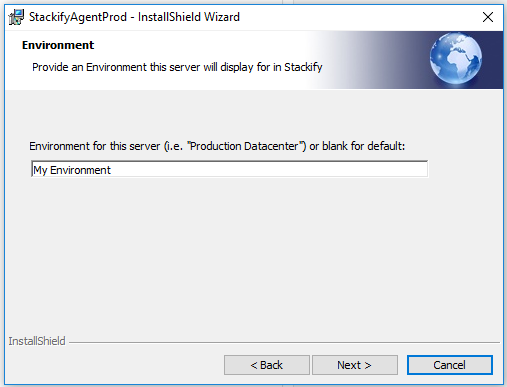 You can find a link to the Windows Installer from the Getting Started Page in Retrace or by clicking the Add New button at the top of your Servers Monitoring page. Run the downloaded installer and follow the installation steps below. You will be prompted for an Activation Key. This key identifies your server as belonging to your company. For each server, you will be prompted to set the Environment. This is a way of grouping your servers; Retrace gives you the opportunity to set this parameter at install time so that each server is grouped with like servers based on deployment strategies, physical location, client, or whatever makes sense for your particular scenario. Selecting this feature will automatically discover all Java applications and begin monitoring them. 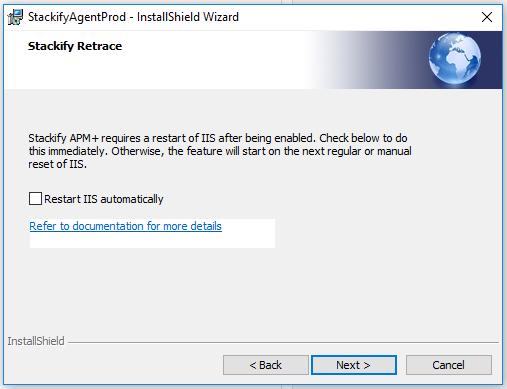 Selecting this option will restart IIS immediately after installation of the Windows agent, which may be unwanted for Production servers. You will still be able to begin monitoring, but you will not receive any APM data until IIS is restarted. 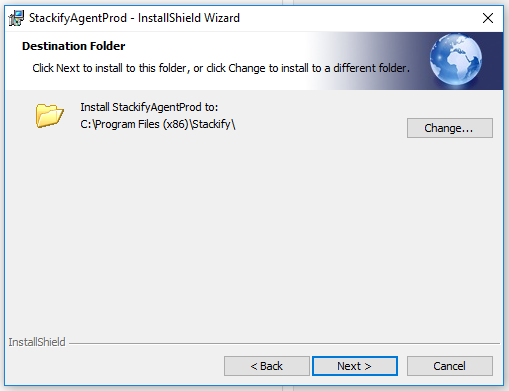 The default installation folder for the Retrace agent is C:Program Files (x86)Stackify. Changing this path may create issues with certain features, such as agent updates, and we recommend leaving the default setting. 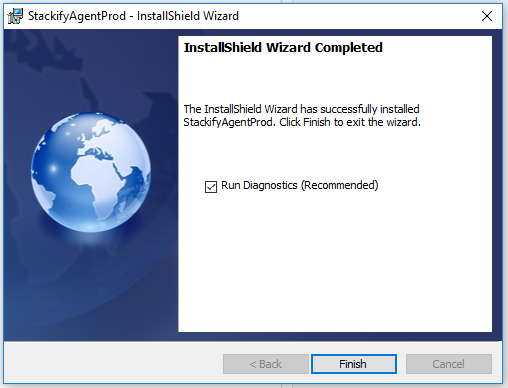 After Installing the agent, you have the option to run Diagnostics on the installation after finishing. We highly recommend running this tool to catch any issues the agent may have connecting to necessary services or installing packages as this can be a huge help when troubleshooting installation issues. You should now be able to login to Retrace and view your server under the Server Monitoring page! Once you have installed the agent on your server, you should be able to find your apps under the 'Monitoring' > 'Web Apps' page. 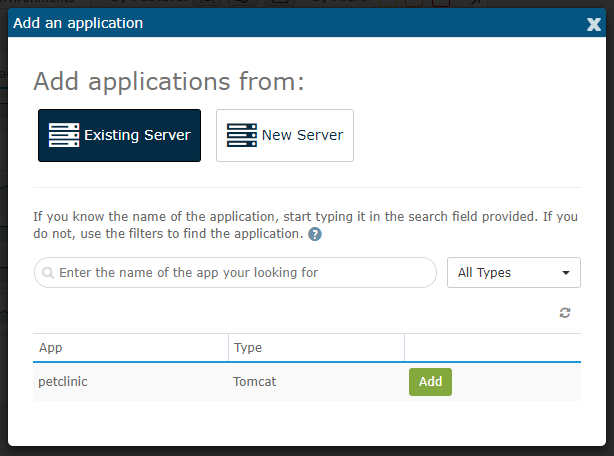 If you can't find the app you are looking for, click the Add App button at the top of the page and try adding the app from an existing server. If you are not seeing APM data show up right away for your apps, that is normal. Once IIS has been restarted please allow at least 30 minutes before you begin troubleshooting as there can be a delay in processing and uploading performance data. The next step is enabling the java profiler.